Nature's Best stocks a wide range of well-balanced and very nutritional mixes, pellets and compressed lucrene cubes that are made from the finest local and imported ingredients. With a variety of delicious and delectable flavours, all Peckish small animal foods have vital nutrients that will benefit the health of your rabbits and guinea pigs, or rats and mice as they chew. Available in a range of convenient bag sizes from 1kg for the smaller background up to 20kg for more commercial operations, we have you covered. Selected from: Lucerne Chaff, Oats, Barley, Wheat, Peas, Maize, Sunflower, Oaten Chaff, Lupins, Canola meal, Lucerne meal, Bentonite, Salt, Di-calcium Phosphate, Vitamin and mineral premix. Suitable for all rabbits and guinea pigs. Peckish Guinea Pig and Rabbit Mix is formulated as a perfect feed for all breeds of rabbits and guinea pigs. Our premium animal feed is high in fibre, protein and roughage to aid in digestion and meet the dietary requirements of healthy rabbits and guinea pigs. Peckish Guinea Pig and Rabbit Mix can be fed standalone -- or in combination with good quality sources of roughage, such as lucerne hay or chaff. Vitamin C is added to meet the requirements of guinea pigs for this essential vitamin. Selected from: Wheat, Barley, Oats, Lupins, Peas, Canola meal, Lucerne meal, Soya meal, Mill run, Bentonite, Salt, Di-calcium Phosphate, Vitamin and mineral premix. Peckish Guinea Pig & Rabbit Pellets have been specially formulated as a high protein and fibre feed for rabbits and guinea pigs. These pellets have also been formulated to meet the vitamin and mineral requirements for healthy growing animals. Peckish Guinea Pig and Rabbit Pellets can be fed standalone or in conjunction with good quality sources of roughage such as lucerne hay or chaff. Vitamin C is added to meet the requirements of guinea pigs for this essential vitamin. Selected from: Lucrene chaff, Lucrene hay. Steam pressed cubes for healthy teeth. Peckish Nibble Blocks are the perfect high protein, high fibre feed for rabbits and guinea pigs. Nibble Blocks are a good quality source of roughage that are essential for a healthy, happy pet. Nibble Blocks should be fed in conjunction with other foods, such as fresh vegetables in order to promote a balanced diet. They are completely natural, and aid your pet's digestion, while being an important part of any small animal's daily dietary requirements. Suitable for up to 12 months. Rabbits and Guinea Pigs require high fibre diets, and Peckish Small Animal Greens are the perfect high fibre feed for your pets. Peckish Small Animal Greens are completely natural, high in protein, and offer a high quality source of roughage essential for your pet's health and digestion. Peckish Small Animal Greens are an essential part of all small animal's daily dietary requirements and are best fed in combination with Peckish Guinea Pig and Rabbit Mix or Pellets and some fresh vegetables. Selected from: A variety of Tasmanian grown Pasture Hays. Suitable for small animals from 12 months. As Rabbits and Guinea Pigs mature and grow into adulthood, their diet requires extra fibre and less protein. Peckish Small Animal Greens for Adults features all natural premium pastured hay grown in pristine Tasmania, providing a high quality and rich fibre source that is essential for your small animal's health and digestion. 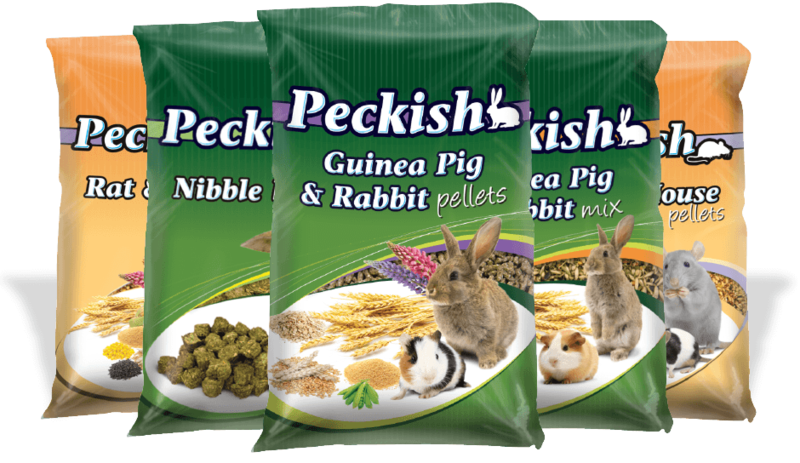 Best fed in combination with Peckish Guinea Pig and Rabbit Pellets and some fresh vegetables. Suitable for all breeds of Rabbits and Guinea Pigs from 1 year old and ideal to maintain a healthy weight. Selected from: Wheat, Oats, Barley, Sorghum, Cracked Maize, Cracked Lupins, Black Sunflower. Balanced mix of grains and seeds. Peckish Rat & Mouse Menu is specially formulated for all your pets nutritional needs. This hearty mix of grains and seeds is manufactured here in Australia using only local ingredients, so you know the quality is second to none. Rat & Mouse Menu contains everything your pet needs to sustain a healthy, vibrant life. ​Peckish Rat & Mouse Menu should be introduced gradually. Any change of diet should occur over a 7-10 day period as sudden changes in diet can cause digestive problems. If digestive problems arise, reduce the amount of roughage until normal digestion occurs. Selected from: Wheat, Oats, Barley, Sorghum, Cracked Lupins, Black Sunflower. Peckish Rat & Mouse Pellets are specially formulated for all your pet's nutritional needs. This hearty mix of grains and seeds is manufactured here in Australia using only local ingredients, so you know the quality is second to none. Rat & Mouse Pellets contains everything your pet needs to sustain a healthy, vibrant life. Peckish Rat & Mouse Pellets should be introduced gradually. Any change of diet should occur over a 7-10 day period as sudden changes in diet can cause digestive problems. If digestive problems arise, reduce the amount of Rat & Mouse Pellets and substantially increase the amount of roughage until normal digestion occurs. Pet's Harvest Small Animal Range features a healthy assortment of grains and minerals specially chosen to ensure your small friends have a balanced diet. Available in a mix or a convenient pellet form.